So new forms appeared abruptly in the fossil record and Darwin could not explain how such innovation evolved, but it was nature’s fault. Intelligent design advocates say the world conspicuously allows for discovery, but evolutionists say the opposite. I don't know how you manage it CH, but you're still finding new ways to post even dumber things than the low-bar posts of before. Well I suppose it's a good thing that we've unearthed a veritable treasure trove of fossils in the last 150 years then. And - shockingly - every single fossil fits a pattern of common descent. Tedford, what did Raoult actually say about Darwin? Did he say that evolution is not a well-supported theory? Darwin was wrong about many things: what precise error was Raoult referring to? Direct quotations, please, not excerpts from an article about Raoult by French writer Catherine Mary that was published in Science Magazine. Well I'm certainly not doubting his credentials. However, I am curious to hear him expand on those words. Qualified or not, his say-so alone is not conclusive. What evidence has led him to say this? What does he think the truth of the matter actually is? If he cannot explain all this then his opinion is only so much hot air and ink. Because, frankly, bearing in mind his is a microbiologist, studying viruses, it doesn't seem unreasonable to conclude this is a slightly sensationalist quip referring to the fact that the simple tree of life gets very muddled and complicated when we get down to the viral level. Unfortunately I cannot seem to find out. Google him and you just get swamped with ID blogs and sites hailing him as the messiah of biology saying 'Evolution is WRONG' as the last word on the matter. And now let me ask you - why do you dismiss the tens of thousands of eminently qualified biologists who categorically state that evolution is true? Are they not qualified? Are they all idiots? If you are appealing to the authority of a single scientist, how can you answer when tens of thousands are brought to bear against you? Are we only to listen to scientists when they say things you personally approve of? Wow Tedford. The level of your ignorance and gullibility never ceases to amaze. You read a heavily spun article from the DI and immediately start frothing at the mouth screaming DARWINISM IS DEAD!!! ", without the slightest attempt to research or understand. Raoult's position is merely that lateral gene transfer (LGT) should be considered a more important mechanism of evolution than previously thought, especially among single celled organisms. NOT that evolution didn't occur, NOT that common descent is wrong. Just that the 'tree of life' has more lateral connections due to LGT and should be looked at more like a bush (which Raoult calls a 'rhizome'). This is not a particularly new or extraordinary claim - biologists have known about this for several decades. But you're an idiot who desperately need to cling to any glimmer of hope that somehow evilution will be proven wrong. Planck precursor of ID movement? 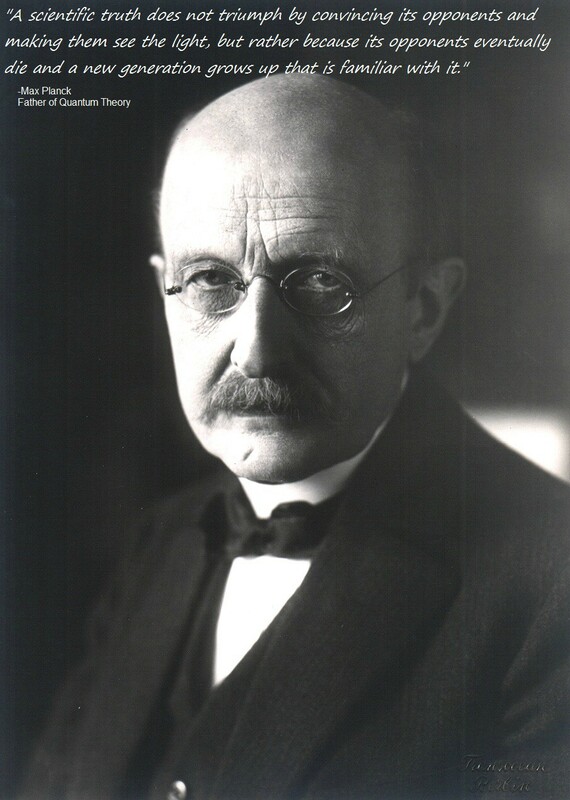 Planck forseeing the consecuences of naturalism? I do not think this is how creationists will loose. As you know it is all about the best fitted, and the religious gene is better than the ateist one. So new forms appeared abruptly in the fossil record and Darwin could not explain how such innovation evolved, but it was nature’s fault. "In fact the a priori reasoning is so entirely satisfactory to me that if the facts won't fit in, why so much the worse for the facts is my feeling." (Erasmus Darwin, in a letter to his brother Charles, after reading his new book, "The Origin of Species," in Darwin F., ed., "The Life of Charles Darwin,"
And, of course, we've discovered absolutely no new fossils or learned nothing new about biology, such as DNA or molecular biology, since Erasmus Darwin made that statement, right? We've discovered how complex life is, which makes Erasmus Darwin's statement even MORE absurd and UNscientific. We've discoverd new fossil since Darwin's day. What is almost completely missing from the fossil record are examples of one species changing into another, which is what evolution is. National, we all know that complex things are designed? How? Nat, more fossils mean more gaps? Really? Intelligent design advocates say the world conspicuously allows for discovery, but evolutionists say the opposite. We already know that evolutionists have been finding lots of fossils and that they expect to find more so you are obviously flat out wrong. But what about IDists? What discoveries have IDists made regarding the fossil record? Or, alternatively, what discoveries would they allow? And why? Did Darwin performed any research activity? As far as I know he was steering at a farm, made a trip around the world and then writed teory of his and|other observation. No matter of that is considered a extraordinary scientific. Did Darwin performed any research activity? Yes. Did you do any research into the matter before asking the question? Why is the fossil record in any way relevant to biological study? I understand it might provide predictive compliments to a biological theory but comparing casts is not biological study. I mean that without the geological strata concept of age there would be no biological connection. So the cast fossil being studied is not being studied for its biology but for its geology relevance. Fossilism is only a side detail to anything dealing with biological investigation. Its been the great flaw of logic to propose or oppose evolutionary ideas by examining the fossil record. Having said that if evolution is not true then there could not be found any evidence of biological trails. YEC see the geological layers as laid in the same event with just segregated episodes in the event. So the fossils are just what is picked up down the road a hundred miles or so. So looking at the fossil record does not help evolution nor does it hurt evolution as its only a moment in time by our reckoning. No intermediates will be found but only varieties . Darwin was wrong in saying fossils count as biological research for drawing conclusions about biological processes. No biology going on here. Just a special case of comparing things and then saying they are divided in time and so proof of change. Wow, the IDC tard just goes on and on and on. Raoult is saying what any open minded and outspoken scientist has been saying for a long time. Darwin was flat out wrong. Of course evolution remains an assumed fact, but it keeps its status not because of evidence or because the mechanisms of supposed evolution are known. Evolution is a philosophy of interpreting the world. It is assumed to be fact, like gravity. Yet, it is not like gravity at all because it has never been observed. It even fails as a historical inference, because nothing that we see happening now can reasonably infer the grand claims that supposedly occured in the past when no one was watching. Evolution has never been observed to occur in the history of science. A primary speciation event has never been observed. Unbounded and directional change has never been observed in the history of science. From all the bluster and smoke from evolutionists, Darwinism was said to be a good explanation of evolution for the last 150 years. Oh, they admit that it may need to be tweeked a bit, but nothing but minor details that needed to be worked out. The bluster of the last 150 years does not match the statements of scientists such as Raoult. Evolutionists put on a happy face in public, but statements like these betray a theory in crisis. Evolutionists put on a happy face in public, but statements like these betray a theory in crisis. Keep telling yourself that fat man, if it helps to keep your nightmares away. The scientific community will keep rolling right along, making discoveries, increasing our understanding of the natural world. You can pine for the good old days when the Church could hold inquisitions, torture dissenters, and throw heretics like Galileo in jail. You can pine for the good old days when the Church could hold inquisitions, torture dissenters, and throw heretics like Galileo in jail. Galileo was under house arrest. He had two daughters who were nuns. He was friends with the Pope. He was on good terms, generally, with many of the higher ups. He was punished because he was publishing books without first getting "imprimaturs". Let's get the history correct. Now, what about Craig Sternberg? What about Peter Duesberg? What about Abraham Velikovsky? What about Granville Sewell? Just how pure is this wonderful world of science. Let's get the history correct. "The trial by the Congregation moved to its conclusion. Several of the ten cardinals apparently pushed for Galileo's incarceration in prison, while those more supportive of Galileo argued that--with changes--the Dialogue ought to continue to be allowed to circulate. In the end, a majority of the cardinals--rejecting much of the Commissary's agreement with Galileo--demanded Galileo "even with the threat of torture...abjure in a plenary assembly of the Congregation of the Holy Office...[and] then be condemned to imprisonment at the pleasure of the Holy Congregation." Moreover, the cardinals declared, the Dialogue "is to be prohibited." The way you IDiots always try to spin things is hilarious. Now, what about Craig Sternberg? You mean the Creationist who misused his editor's powers to dishonestly sneak an ID article into publication, bypassing proper peer review? You mean the wingnut HIV/AIDS denier? Never heard of him. There was an Immanuel Velikovsky who published some wackjob theories back in the 50's about Earth almost colliding with Venus. You mean the Creationist who is still making a fool out of himself with his "Evolution violates the 2LoT' claims? Yeah PaV, your IDC side sure has some real winners. Here's a quote that shows you just how wrong you are. This is not, however, the attitude of Pope John Paul II. In 1979, he expressed the wish that the Pontifical Academy of Sciences conduct an in-depth study of the celebrated case. A commission of scholars was convened, and they presented their report to the Pope on October 31, 1992. Contrary to reports in The New York Times and other conduits of misinformation about the Church, the Holy See was not on this occasion finally throwing in the towel and admitting that the earth revolves around the sun. That particular debate, so far as the Church was concerned, had been closed since at least 1741 when Benedict XIV bid the Holy Office grant an imprimatur to the first edition of the Complete Works of Galileo. And, of course, are you going to say I was wrong about his daughters, or that Galileo knew the Pope? The Victorian biologist Thomas Henry Huxley, who had no brief for Catholicism, once examined the case and concluded that “the Church had the best of it.” The most striking point about the whole affair is that until Galileo forced the issue into the realm of theology, the Church had been a willing ombudsman for the new astronomy. It had encouraged the work of Copernicus and sheltered Kepler against the persecutions of Calvinists. Problems only arose when the debate went beyond the mere question of celestial mechanics. But here we need some historical background. I understand that many historians feel that the persecution of Galileo was due mostly to politics than science. The Pope needed to look like a strong leader to counter the Reformation. Amnd some historians feel that Galileo's book insulted the Pope personally. That's why Galileo was persecuted. It was hurt feelings, not science.